Home Page | blog | What are the Symptoms of Spinal Cancer? The symptoms of spinal cancer depend on various factors such as the type of a tumour, location, size, and extent of a tumour, your age, medical history and more. There are some common symptoms of spinal cancer such as pain, numbness, weakness, tingling and urine problem. According to study, the symptoms of spinal cancer occur very slowly, however, earlier the occurrence of spinal cancer was very often and it can occur over a matter of hours or days. Metastatic spinal tumors are the tumours which spread to the spine from another location in the body and often progress quickly. 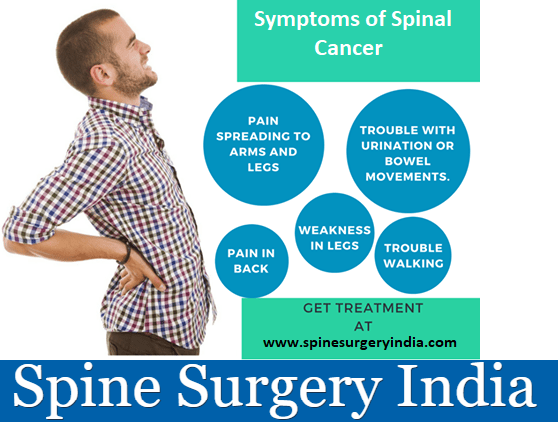 In case, you are dealing with the pain then you need to visit the doctor as the pain is the most noticeable sign of spinal cancer. Pain can come from the tumour’s presence in your spinal column and they push the sensitive nerve endings or can cause spinal instability. When your spine is not lined up properly then other physically noticeable symptoms may result such as changes in posture, Kyphosis or hunchback. According to study, when a tumour presses on your spinal cord then the symptoms like numbness or tingling in the arms or legs will begin or there be clumsiness which means you do not know where your feet are. As the spinal cancer increase, the symptoms may grow which include weakness, inability to move your legs and eventually paralysis. What are the available treatments for Spinal Cancer? a) Traditional Surgery: With the help of the latest and advanced techniques and instruments, the neurosurgeons at the hospitals under Spine Surgery India can reach to access tumors in the patient’s spine or vertebrae by using the microscopes at the time of surgery. If they are unable to remove a tumour completely then they might follow the surgery with radiation therapy, chemotherapy or both. b) Radiation Therapy: The surgeon’s first line of treatment is the traditional radiation therapy for vertebral cancerous tumors; however, if the tumours are not treated with traditional radiation therapy then the surgeon will use the radiation therapy to eliminate remnants of any spinal tumors after surgery. Radiation therapy is also used to treat inoperable tumors or tumors where surgery is too risky. c) Chemotherapy: This is a common treatment which is helpful in treating many types of cancer. This is a therapy where the surgeon will use the powerful drugs to destroy tumors and stop cancer cells from growing. With the advancement in medical science, there are more than 100 types of chemotherapy drugs, which can be given to the patient by orally or through an IV. Chemotherapy is a treatment which doesn’t target cancer cells and it might affect both healthy tissue and the tumour. Chemotherapy is a therapy in which patients often experience adverse side effects, such as severe nausea and vomiting, infections, fatigue, weight loss etc. d) Surgery: The surgeon usually performs the surgery to stabilize your spine, protect the spinal cord and to maintain the function and pain in your spine. There are chances when the surgeons are able to remove the spinal tumours completely; however, if they are unable to remove completely then they will remove some of your spinal tumours. The pathologist will take a sample of cells from a tumour and examined under a microscope. After the examination, your pathologist will able to find out the type of a tumour and will suggest the further treatment. e) Combination Treatment: There are cases where the surgeons will give the combination of chemotherapy, radiotherapy, and surgery to some patients, however, these treatments have side-effects, which will be discussed with you prior to treatment. f) Steroids: Steroids are chemicals which naturally produced in your body and your surgeon will give you the steroids in the form of tablets or by injection which can reduce the swelling that surrounds spinal tumours. Steroids do not treat a tumour; however, they can improve symptoms and make you feel better.